FemaleScienceProfessor: Psychic killer qu'est-ce que c'est? 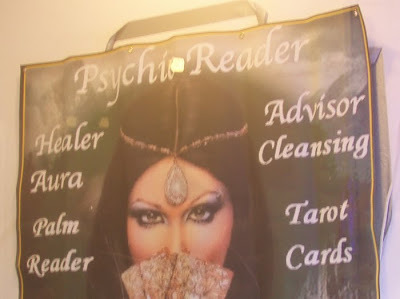 The service described in the upper right of this sign is a bit chilling, no? This is different from the emergency showers in the lab? Maybe it refers to colonic cleansing. Eeew. As long as it's a solo event and not occurring at group meeting, I suppose it's okay. My advisor(s) need(s) some serious cleaning out. Ears.... and other body parts. Can you send me the phone number for this service? Thx. Let's not confuse a Physic and a Psychic here! I'm not familiar about advisor cleansing.